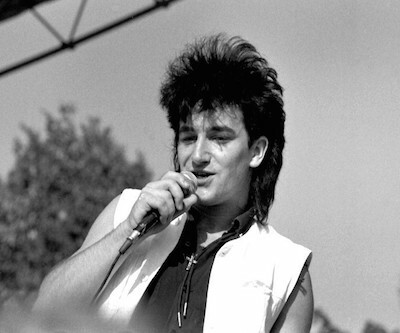 Image of U2 lead singer Bono, at the Isle of Calf Festival, Norway, 1983. From Wikimedia Commons, by Helge Øverås. In 1988 the frontier city of Calgary, Alberta was hosting the Winter Olympics, U2's The Joshua Tree won a Grammy for best album of the year, and the best picture at the Oscar's went to The Last Emperor, although the more memorable nominee was most certainly Fatal Attraction, featuring Glenn Close in a terrifying stalker role. What does any of this have to do with mining? The year. 1988 was also the year that gold production in Nevada was under 5 million ounces. According to a new Division of Minerals report put out by the state, just 4.94 million ounces was extracted from Nevada's 30 mines in 2014, compared to 5.5 million ounces the previous year. 2014 was the first time since 1988 that production of the precious metal dropped so low. Of course, the bugbear in the low production figures is the gold price, which on Friday closed just $24 above the yearly lows reached in July of $1,084.50 an ounce. However, prices aren't the only determinant in the state's gold production, evidenced by the fact that in 1998, when gold was hovering between $425 and $450 an ounce, Nevada gold production was at a record 9 million ounces. Part of the reason is the fact that more of the gold now mined in the state is refractory ore, "which requires an additional process that boosts production costs and can also limit production" the Las Vegas Review Journal quotes Richard Perry, with the Division of Minerals, in an article posted on Saturday about the low production figures. Nevada is the United States' largest gold producer, accounting for three quarters of production and 6.1 percent of world gold production, the Nevada Mining Association states. Research by the Review Journal shows Newmont's Carlin Trend operations are the largest gold producer in the region at 907,282 ounces, followed by Barrick Goldstrike Mines' Betze-Post operation at 515,641 ounces. Mines that have closed because they cannot be profitable at current gold prices include Allied Nevada's Hycroft mine, which suspended operations this summer. The article also notes that while gold production declined in Nevada, silver output increased, at 10.9 million ounces in 2014 compared to around 8 million ounces in 2013.